). But when it comes to my own baking projects, I've been pulled towards "earthier" items that have at least a modicum of nutrition (think whole grains, fruits, etc.). I know! I can't believe it either. It's really something crazy. Take what happened the other day--I wanted the aforementioned frothy-looking cupcake something fierce, piled high with buttercream, which unfortunately they make no mention of in "The Pregnancy Diet" section of What To Expect When You're Expecting. 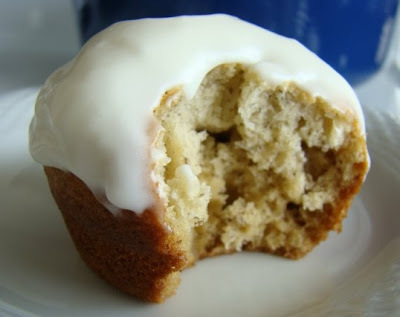 But after a few minutes of hemming and hawing, I decided I really should bake something slightly more virtuous, and I settled on a banana cupcake with a glazey, lightened up cream cheese icing. And so it began, using the brilliant Rose Levy Beranbaum's Banana Cake recipe as my starting point, and doctoring up a classic cream cheese frosting to cut the fat and the amount of icing that could be dolloped on each cupcake. The finished cakes taste of a bold, flavorful banana bread, peppered with those mysterious black speckles that always appear inside after baking (can someone enlighten me as to what these speckles are? Seeds, random fiber, what? ), and have a wonderfully springy, toothsome quality that contrasts in the most interesting way with the tender, delicate, cake-like crumb. And technically, this cake is a quick bread given its mixing method (wet ingredients all combined at once and mixed into the dries, no creaming of butter or sugar involved) but the use of cake flour instead of all-purpose changes the texture entirely. The use of light cream cheese instead of full-fat yielded a topping with a thinner consistency ("light" versions of dairy products almost always contain more water than their full-fat counterparts), but retained all the flavor. A glorious, fluffy buttercream it is not, but that was kind of my point--I wanted a little to go a long way, making the whole thing less sugary while still getting that suggestion of a tangy-sweet cream cheese frosting. So now would be a good time to mention that if you want something fluffier, make the frosting recipe with full-fat cream cheese and sour cream. But give the lighter version a try if you happen to be going through a more virtuous baking phase like myself--you won't be disappointed. As is the case with banana bread, use your sad, brown, way overripe bananas that you bought in too large of a bunch to eat before they all went bad here. I keep a stash of these in my freezer--they thaw quickly on the countertop, but make sure they are room temperature (a quick zap in the microwave will warm them quickly) before incorporating them into batters. 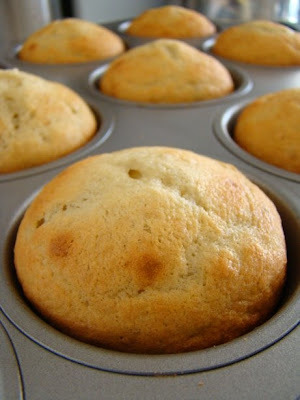 To make the cakes, preheat the oven to 350 degrees and lightly grease two 12-cup muffin tins or line them with paper liners. In a large bowl, whisk together the cake flour, sugar, baking soda, baking powder and salt and set aside. In a separate bowl using an electric hand mixer (or in a food processor or blender if you don't mind the extra dirty dishes) combine the bananas and sour cream, blending until smooth (a few tiny banana chunks may remain). Add the eggs and vanilla and blend again until well combined. Add half the banana mixture to the dry ingredients along with the butter and beat on low speed until the dry ingredients are just moistened. Scrape down the bowl and increase the speed to medium, beating for about 1-2 minutes. Add the rest of the banana mixture in two batches, beating after each addition until well blended. Portion the batter into the prepared muffin tins and bake until the tops spring back when touched and a toothpick comes out clean, about 15-17 minutes. Cool completely on wire racks before icing. 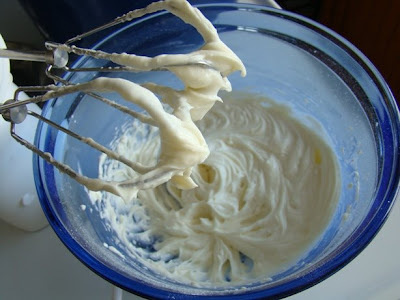 To make the icing, beat together the cream cheese, butter, sour cream, vanilla and salt until smooth. Gradually beat in the confectioners' sugar until well-combined. 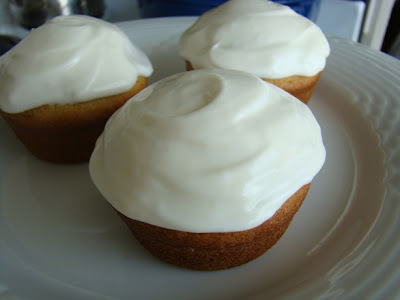 When the cupcakes are completely cooled, top them generously with the cream cheese icing. Refrigerate any leftover icing.